A female creator. Someone or something that creates; feminine in nature. 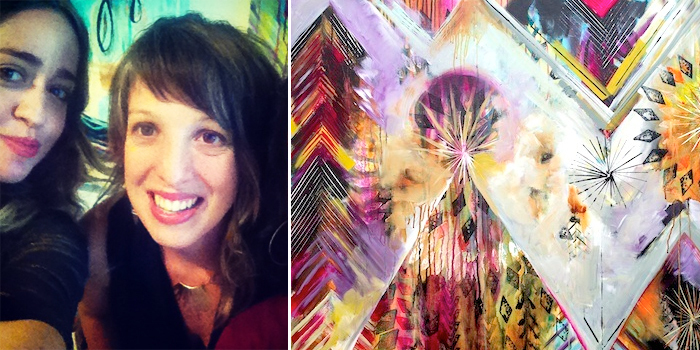 A few days ago I had the divine pleasure of speaking with the lovely Flora Bowley, goddess-in-paint extraordinaire. 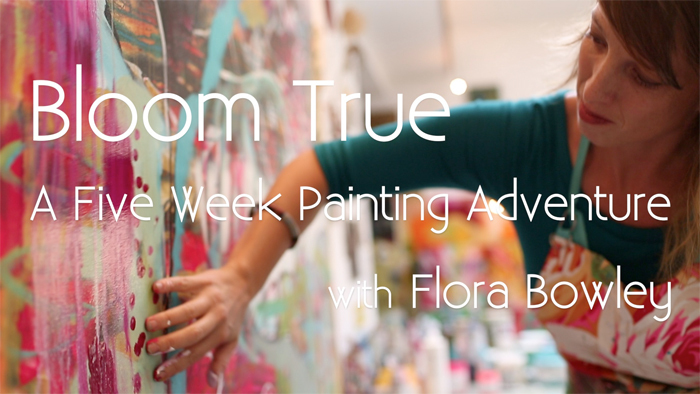 I first met Flora several years ago when we were both teaching at an art-making retreat. I had heard of her work through some mutual artist friends for years, and we later discovered how much we have in common in terms of our philosophy of creating, living, loving, and being. So it was so nice to have a have a sweet chat with her and discuss our upcoming projects and thoughts on art-making and creative community, along with the practice of gratitude, among other gems. Flora and I at her art opening in the Pearl district of Portland (left). One of her powerful bright and bold creations (right). Flora’s newly improved ecourse starts September 30th (very soon)! This painting on paper I created several years ago is entitled “The Jeweled Forest“. 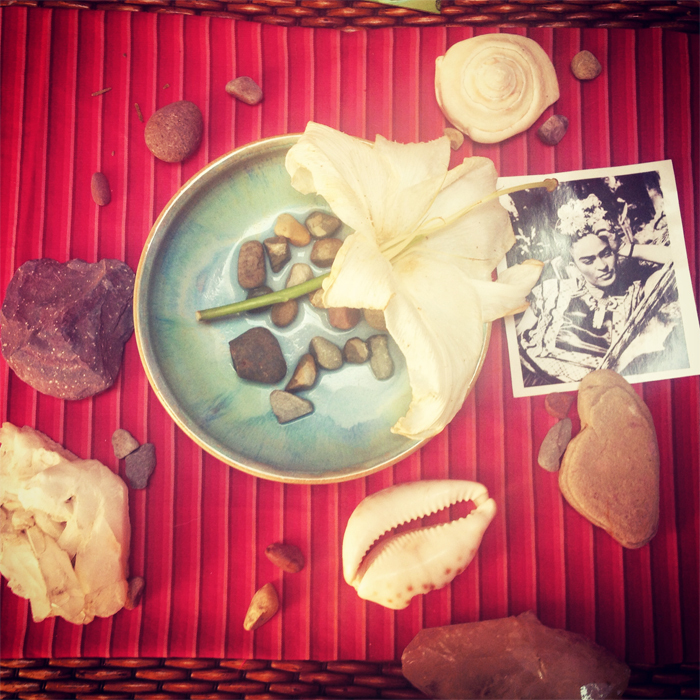 I assembled this altar welcoming the Change of Season and new beginnings. This has proven to me to be a season of shedding and letting go, and welcoming my newly birthed self, bare bones and all, to that which meets my greatest joy, my soul, my self. 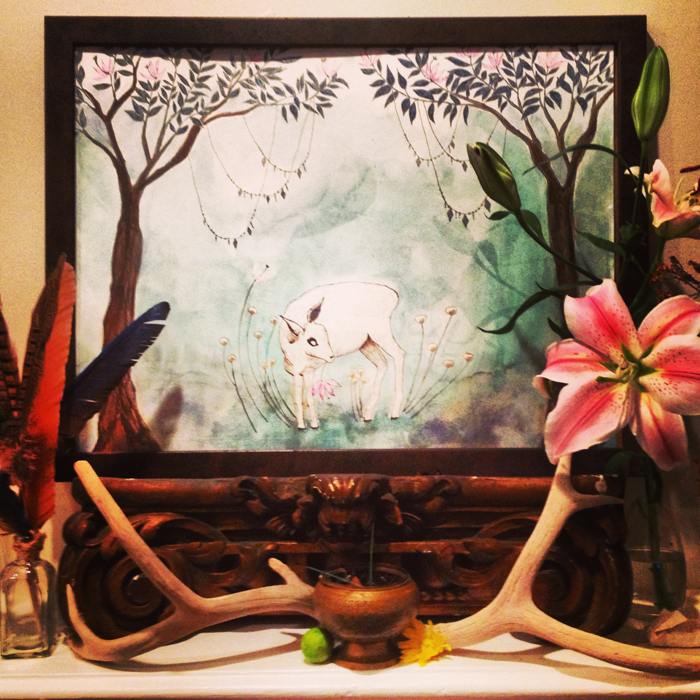 Learn to create sacred altar paintings, pen and ink, acrylics, mixed media, and more gems through my upcoming course. Here is a video of our chat. I adored sitting with this beloved spirit and plan on sharing more with others in our ever-expanding network of spirited creatrixes. 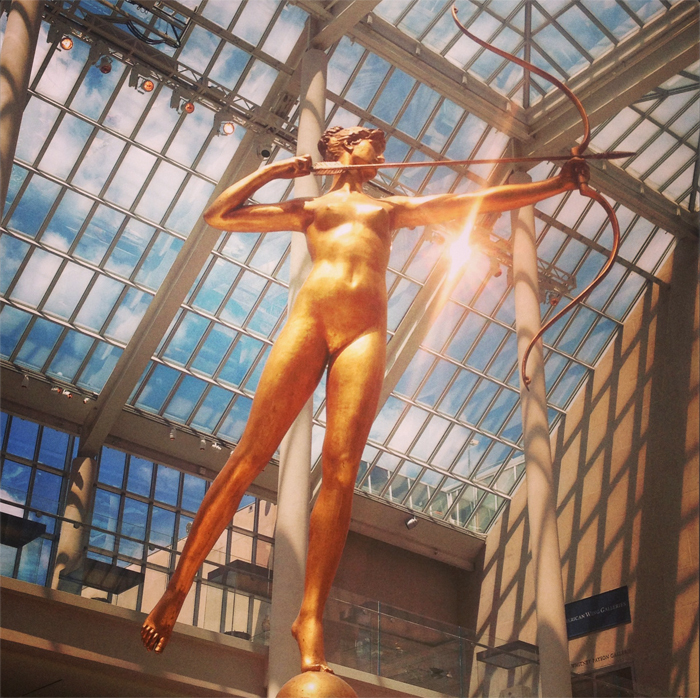 So perhaps something in you is longing to explore your artist within? We welcome to join us in deepening your voice, seeing what in you is craving to come and step out, to express and share your truth in a way that feels supportive and fulfilling. As Flora and I share, there is no competition here, just an ever-expanding circle of love and creation. Hey girls! This is so fun! I LOVED listening to you both talk it up! Thank you for sharing, such an inspiration! I’d like to take both of your courses! Sitting here loving listening to you both! What inspired sweethearts! I love this. So beautiful in every way! I am already signed up for both of your courses and I cannot wait! Love you and Flora’s work. You guys are absolutely amazing and inspirational artists!! Thank you everyone — you are all so kind and its deeply heartfelt and appreciated! So good to see both of you here and feeling deep gratitude for the inspiring and beautiful women you are. I took Flora’s very first e-course and she awakened my love for painting: now I am really looking forward to explore more thanks to your upcoming course, Alena. Your words resonate with me on so many levels: the importance of community and connection, the links between painting/the creative process and life, letting go, unlearn and doing instead of knowing, making the magic happen, living your life through intention, looking through the lense of gratitude (a life-changing experience for me) etc. etc. Painting and other ways of creative expression really helped and help me to grow: looking forward to your next books, ladies, as the ideas really speak to me and I especially love the fact that you, Alena, will pay attention to the exploration of the seasons throughout your course as it’s so important to live according to the ‘laws’ of nature, in harmony with the natural processes. Nature is one of our biggest teachers, if not the biggest, isn’t she? I am a big fan of Flora’s weekly letters, as they are great food for thought and I can’t wait to have them lying next to me, compiled in a book, accompanied by your stunning, colourful creations. Thank you, Alena and Flora, for being YOU! Wow, what a juicy chat you ladies had!! i am currently taking Flora’s ecourse and loving it! Somehow, since I started listening to my deepest voice of my deepest desire to create art last year , something has guided me to your book, Kellyrea’s Matirose’s and Flora’s and it is just recently that I found out that you guys are all connected and have this beautiful community of art. I love the idea of “unlearning”. Flora talks a lot about the concept of letting go and I think unlearning is a huge part of letting go of the idea of who other people define you are. I have been so well hiding my deepest desire to create art since I was a little girl because I have let other people tell me that I am not good enough or talented enough to be an artist, but since taking Flora’s course, I have been “unlearning” that very thought and learning who I really deeply am and what my deepest soul really wants to manifest. As I started to paint for the first time in 20 years, my burning passion to know more about my own style, what comes out of my hands and body and to know how to put that in paints has grown so much that when I found your e course, I thought it would be just perfect!!! I am due with the second baby this December so next year is going to be a very slow, busy, and learning year. Your one-year course could not be more than perfect!!! I will see you online next year!!! Thank you so much for sharing your world to the rest of the world. It means so much to us!!! Darling women!!! You are my INSPIRATION! Thank you for sharing here. I am so glad you are taking this step to further move to your dreams and innate desires to EXPRESS and play in the world of color and love, really. LOVE. Can’t wait for the course to begin really…. plus there’s so much to look forward to. Thank you for being here. I do believe all of the concepts you’ve presented to your post.